As with china and crystal, Replacements recommends hand cleaning for silver. Silver’s finish actually improves with daily use, what better reason to use it regularly! Silver pieces that are used regularly will develop a “patina”, which is actually a blending of thousands of microscopic scratches. This patina creates a beautiful satin finish. Rotate the use of all of your pieces to create an even “patina” throughout your set. After using your silver, consider these cleaning tips. Wash silver immediately after use. 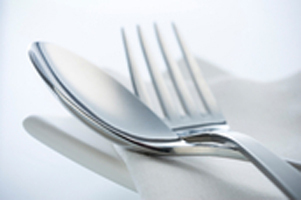 If food is left on silver for periods as short as one hour, it can permanently stain sterling and damage silverplate. Be especially wary of foods such as mayonnaise, vinegar, and eggs. Put a rubber mat or dishtowel in the bottom of your sink to prevent contact between the silver and any metals that are a part of your sink. Use a soft cloth, mild detergent, and hot water to clean silver. Take special care to use a mild detergent, avoid lemon-scented detergents as they can cause rust spots on silver handles and blades. Don’t use abrasive pads or steel wool to remove debris. Dry silver immediately after washing with a soft cloth to prevent water spots. Sterling silver, especially hollow-handled pieces, should never be placed in a dishwasher. The heat from the automatic dishwasher cleaning process can loosen the adhesives in the knife handles, potentially causing a “rattling” noise. Avoid placing silver on hot surfaces such as heating elements, or near open flames. Before beginning, use a lint-free cloth or soft toothbrush to clean the silver surface of dust. Wash pieces per recommendations above to clear all debris. Hint – if you are trying to remove candle wax from candlesticks – simply run the soiled area under hot water. Remove wax with your fingers, and avoid using knife blades to remove wax. It is important at this point to dry each piece thoroughly. Hint – use a blow dryer on a low setting to dry hard to reach places. Apply a top grade silver polish in a gentle, circular motion. Let the polished pieces sit per polish instructions. As appropriate, remove applied polish with a lint-free cloth. Wash and dry each piece thoroughly to remove any excess polish. Sterling and silverplate, when not being used for extended periods, should be stored in a silver chest that has a tarnish resistant lining, or in felt bags. Do not store silver in an airtight container.